In a work that Lisa Delpit calls “imperative reading,” Monique W. Morris (Black Stats, Too Beautiful for Words) chronicles the experiences of Black girls across the country whose intricate lives are misunderstood, highly judged—by teachers, administrators, and the justice system—and degraded by the very institutions charged with helping them flourish. 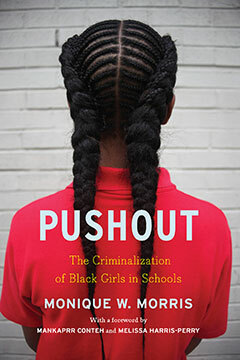 Called “compelling” and “thought-provoking” by Kirkus Reviews, Pushout exposes a world of confined potential and supports the rising movement to challenge the policies, practices, and cultural illiteracy that push countless students out of school and into unhealthy, unstable, and often unsafe futures. Called a book “for everyone who cares about children” by the Washington Post, Morris’s illumination of these critical issues is “timely and important” (Booklist) at a moment when Black girls are the fastest growing population in the juvenile justice system. Praised by voices as wide-ranging as Gloria Steinem and Roland Martin, and highlighted for the audiences of Elle and Jet right alongside those of EdWeek and the Leonard Lopate Show, Pushout is a book that “will stay with you long after you turn the final page” (Bookish).